Show and Tell Meg: Pattern Pyramid Giveaway Winner! 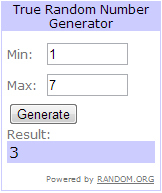 I used random.org to pick our winner for the Pattern Pyramid Giveaway. Congratulations to Felicity from Down Under of tingledfangers! I'm emailing you now to get all your shipping info :) I hope you enjoy that McCalls 2546! Everyone who did not win, be sure to watch Felicity's blog to have another chance at winning one of these babies for yourself! Ooh, thank you. How lucky am I?! This is a delightful game to discover new blogs...off to view Felicity's blog!